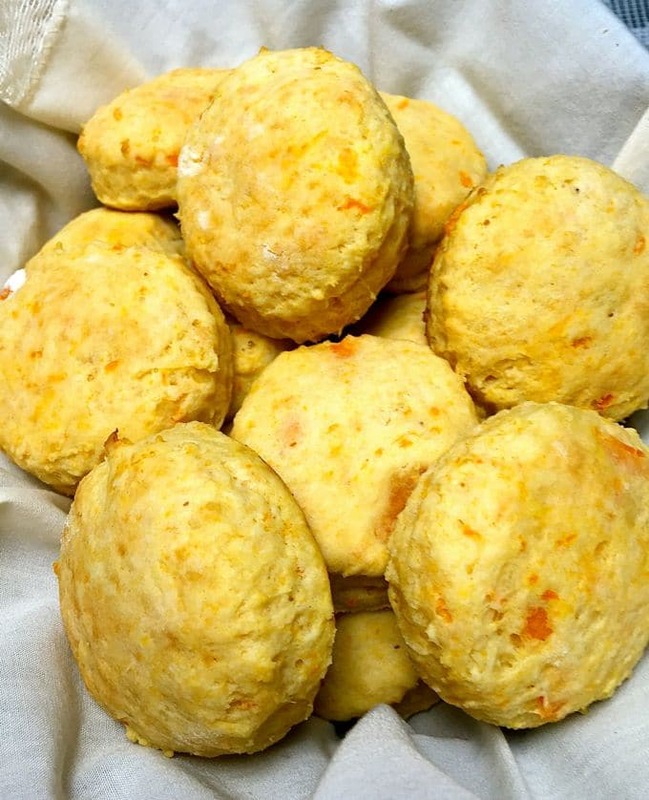 Easy Southern Sweet Potato Biscuits with Cranberry Aioli – say yes, please! How could you not love this combination of sweet and savory flavors? 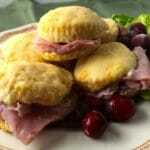 Add some salty country ham and you have a delicious homemade biscuit fit for a king or queen. If you are not planning to entertain the Royals, how about serving these yummy biscuits for an Easter or Mother’s Day Brunch or Lunch? I wish the Internet had taste-a-vision and smell-a-vision so you could taste and smell these divine, fluffy, tender homemade sweet potato biscuits! And, while Sweet Potato Biscuits are something special all by themselves (I’d be embarrassed to say how many I ate straight out of the oven), add some tangy cranberry aioli and a piece of country ham and well, it doesn’t get much better than that! Never made biscuits you say, well hold on to your rolling pin because these scrumptious little morsels are oh so easy to make, they only take minutes to prepare and just eight minutes to bake! And, the best part, you can make the Sweet Potato Biscuits and the Cranberry Aioli a day ahead and just reheat when you are ready to serve them. But be sure to make plenty because these little gems are so good, if you have any sticky fingers in your house, and you know who they are, there just might not be any left to serve the next day. Don’t say I didn’t warn you! Looking for more Easter recipes? Check out these recent posts: 38 Easy Easter Dinners and 33 Dazzling and Delicious Easter Desserts. 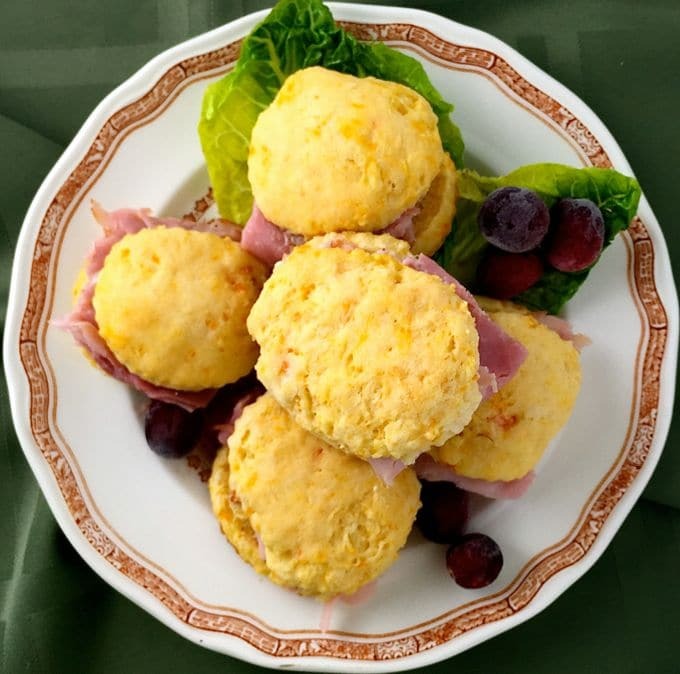 Or for a luscious Easter Brunch menu, how about these delicious Sweet Potato Biscuits, Southern Cheese Grits Casserole, Make-Ahead Frozen Fruit Salad, and luscious Lemon Blackberry Bread Pudding? 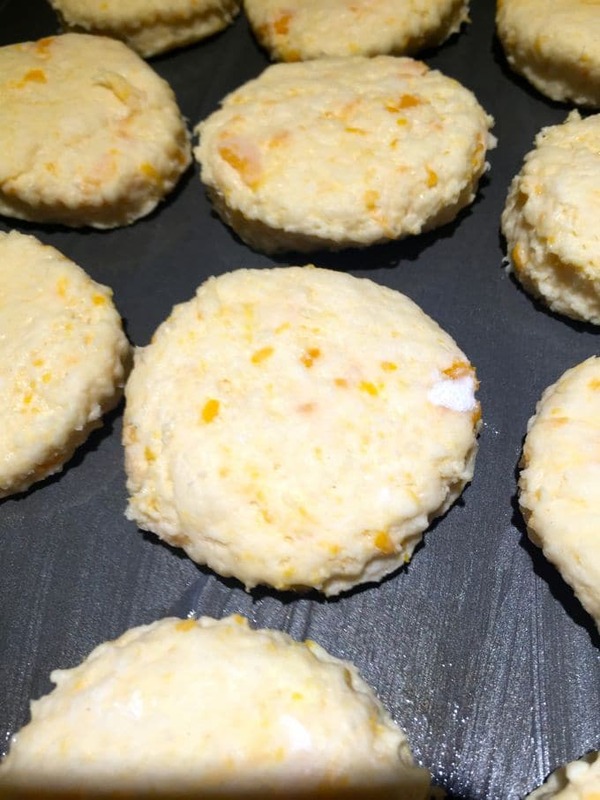 This recipe was inspired by a recipe for Ham Sweet Potato Biscuits in Susan Mason’s Silver Service, Elegant Savannah Cuisine Cookbook which Donna Ross, an old friend of mine, found at a garage sale and gave me last year. Thank you, Donna! 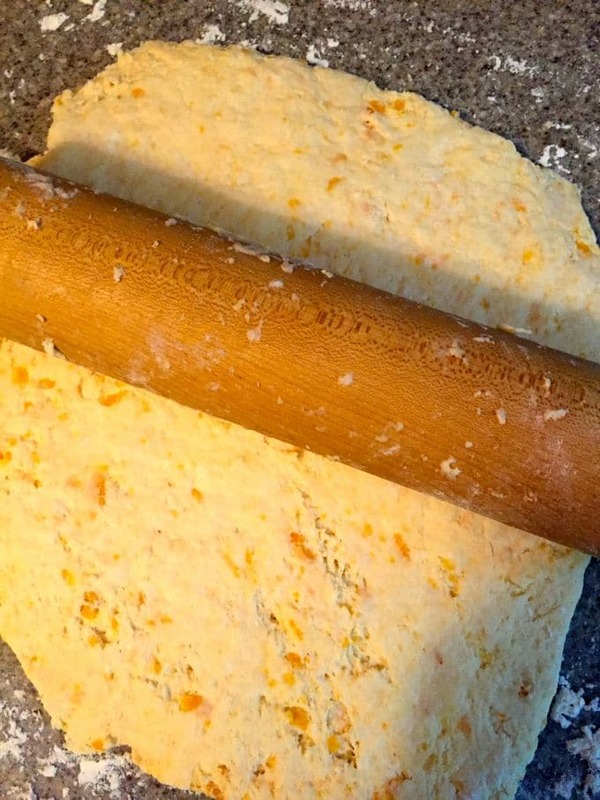 The ingredients for easy homemade Sweet Potato Biscuits include cooked sweet potato, all-purpose flour, milk, butter, granulated sugar, baking powder, and salt. 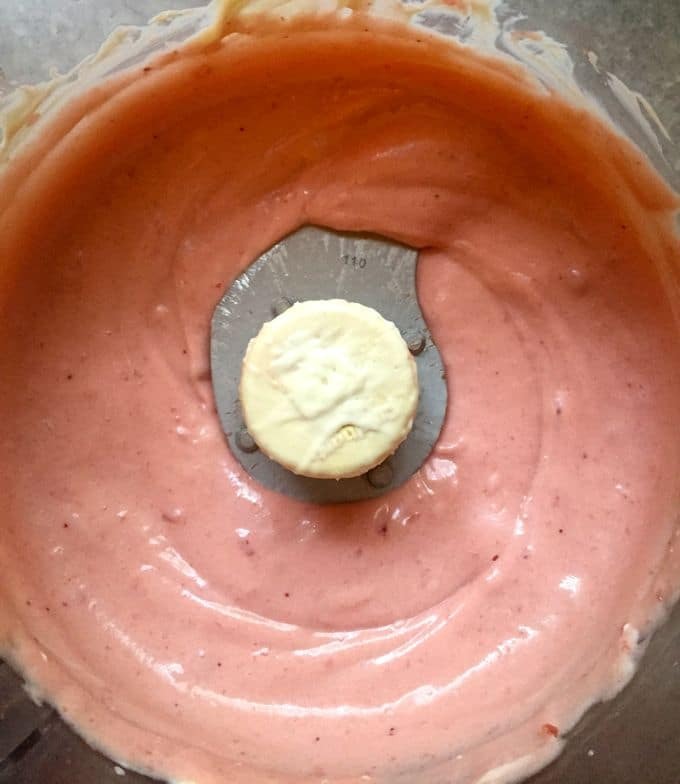 For the Cranberry Aioli, all you will need is cranberry sauce and mayonnaise. And, of course, you will want to add some good country ham! 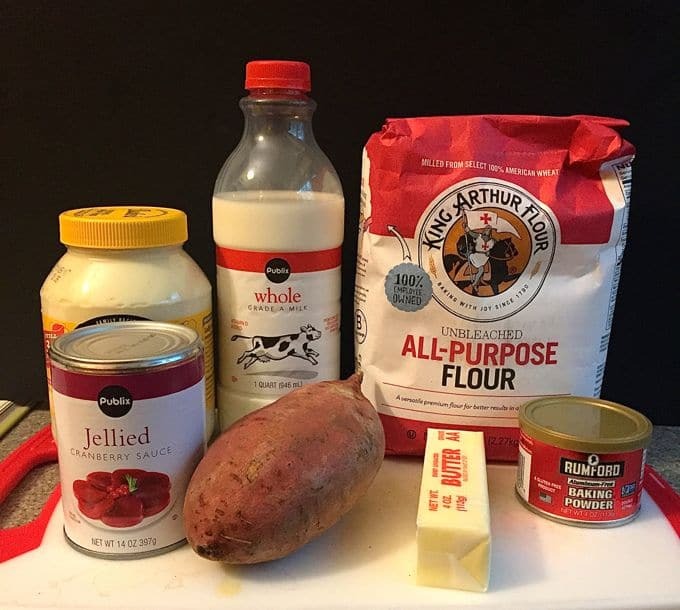 When you are ready to make these Sweet Potato Biscuits gather your ingredients and preheat the oven to 450 degrees. Lightly grease a baking sheet with butter or spray with non-stick cooking or baking spray. If you need to cook the sweet potato, microwave it for approximately 6 minutes or until it is done. Scoop out 1/4 cup of the soft flesh and place in a large bowl. Add the milk and melted butter and mix well. To measure the flour accurately, use a large spoon and fill your measuring cup. Then level it off with the back side of a knife. If you just put your measuring cup in a bag of flour and scoop it, the flour condenses, and you will end up with too much flour, which will make your biscuits dry. Sift the flour, baking powder, sugar and salt into the milk mixture and mix to form a soft dough. Don’t overmix. Place the dough on a lightly floured surface and, with a light hand, gently knead the dough until smooth. Using a light hand and only kneading it until it comes together is the secret to light, fluffy biscuits. If you overwork the dough, your biscuits will be tough. Flour a rolling pin and lightly roll the dough to 1/2 inch thickness. Use a 2-inch cookie or biscuit cutter and cut out the biscuits. Place them on the prepared baking sheet with the biscuits touching. When you have cut out all of the biscuits, take the remaining dough and re-roll it and cut out the remainder of the biscuits. Bake for 8-10 minutes or until done and let cool a little on the baking sheet. While the biscuits are baking, add the cranberry sauce or fresh cranberries and mayonnaise to a food processor fitted with a steel blade. Process until the mixture is smooth. To assemble the Sweet Potato Biscuits, cut the biscuits in half, add a dollop of Cranberry Aioli and a slice of country ham. Serve immediately. 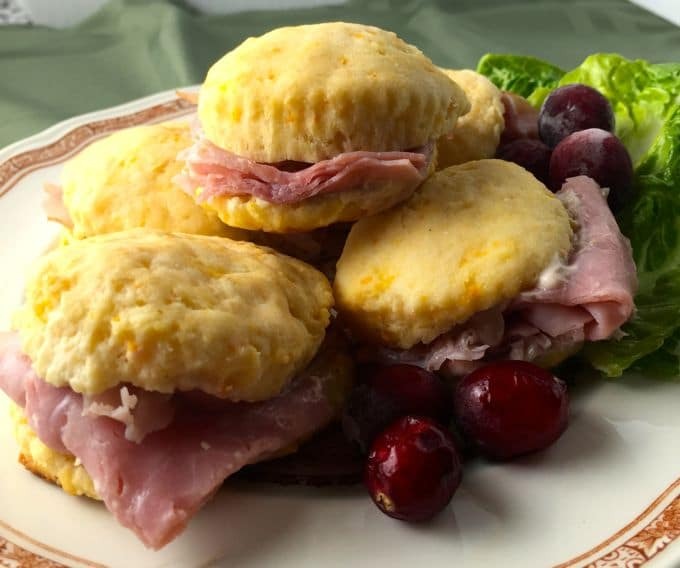 Southern Sweet Potato Biscuits and cranberry aioli with sliced country ham are a delicious combination of sweet and savory flavors. 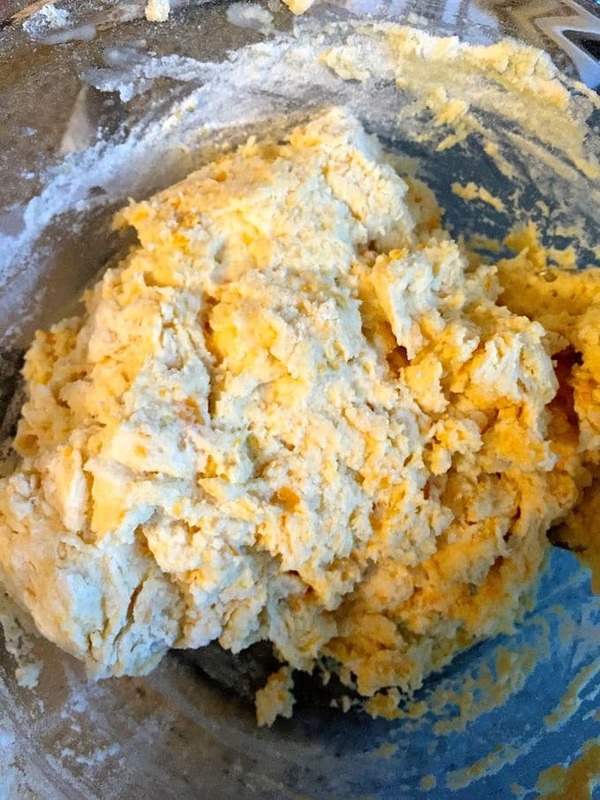 Sift the flour, baking powder, sugar and salt into the milk mixture and mix to form a soft dough. Don't overmix. Flour a rolling pin and lightly roll the dough to 1/2 inch thickness. Use a 2-inch cookie or biscuit cutter and cut out the biscuits. Place them on the prepared baking sheet with the biscuits touching. When you have cut out all of the biscuits, take the remaining dough and re-roll it and cut out the remainder of the biscuits. Wow. These look so yummy. I especially love the ham you put in the biscuits. I could probably eat, 2 or 3 or 4. So delicious looking! Thanks so much! They are yummy and the ham sends them to the stratosphere! Thanks so much! They are good, even without the ham and cranberry aioli. I never see them often, but I LOVE sweet potato biscuits! These little sandwiches sound delicious. Thank you for sharing the recipe! You are very welcome! 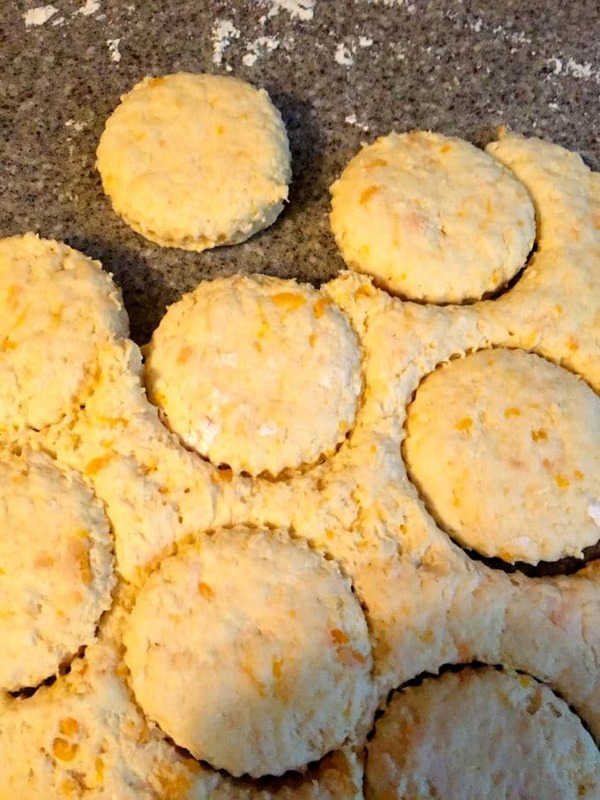 These biscuits are really easy to make and yummy too!